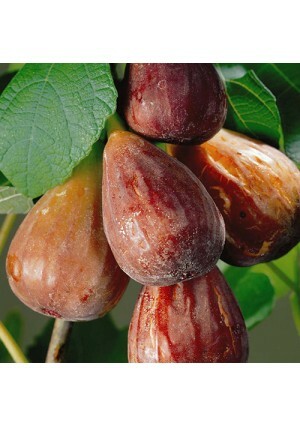 The Brown Turkey Fig has the longest ripening season of the recommended varieties. Although it is not quite as cold hardy as Celeste, it will, if injured by a freeze, produce fair-to-good crops on sucker wood the next season. This is an advantage in areas troubled by late spring frosts. The fruit is medium to large, with a reddish-brown skin tinged with purple. The pulp is reddish-pink and of good quality. It is subject to cracking in wet weather and has a larger eye than Celeste, which will make this fig more prone to souring quickly. The fruit is excellent for making home preserves. Fig trees are tolerant of poorly drained soils and grow well in relatively infertile soils. They have higher yields with a monthly fertilizing program and deep watering twice a month in the summer.